A consensus of economists had predicted real GDP for the fourth quarter to produce a flat reading, according to Thomson Reuters. OTTAWA — Amid predictions of zero growth, the economy surprised by expanding at an annual rate of 0.8 per cent in the final three months of 2015, Statistics Canada said Tuesday. But the better-than-anticipated result for Canada's real gross domestic product remained feeble, something the federal agency largely blamed on weaknesses in business investment, exports and domestic demand. These negative factors partially dampened the economic lift provided by a big decrease in imports. While they deliver a positive input for real GDP, falling imports are not something to get excited about, experts warned. "It's a pretty positive headline at first blush, but when you start looking through the details it's a fairly negative report,'' said TD economist Brian DePratto. 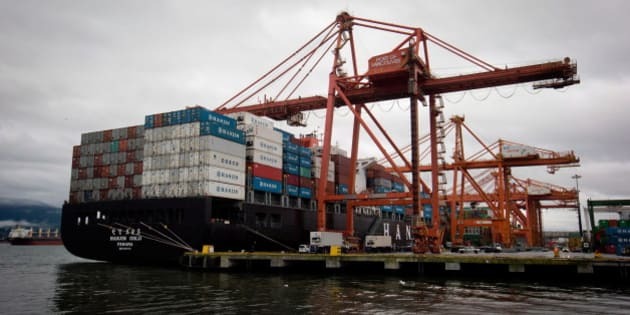 DePratto said the lower Canadian dollar likely contributed to the slide in imports, but noted the decline was also due to the considerable drop in domestic demand. The reading was released as the federal government prepares a spring budget expected to contain billions of dollars worth of commitments — such as infrastructure spending — that it insists will help revive economic growth and create jobs. The budget date is March 22. Last week, the Liberal government acknowledged next year's deficit could surpass $20 billion amid waves of downgraded economic forecasts — and some observers believe it could reach as high as $30 billion. Clobbered by the sudden, steep drop in oil prices, the Canadian economy was in a technical recession in the first half of 2015. It contracted over the first two quarters by a revised 0.9 per cent and again by a revised 0.4 per cent. Real GDP increased by a revised 2.4 per cent in the third quarter. On an annual basis, Statistics Canada's report Tuesday found that the economy grew last year by 1.2 per cent — its slowest pace since the 2009 recession and less than half of the 2.5 per cent reading for 2014. In recent years, the economy expanded 2.2 per cent in 2013, 1.7 per cent in 2012 and 3.1 per cent in 2011. The report said the 2015 number was dragged down by a contraction of 4.8 per cent in business gross fixed capital formation, a category that includes buildings, machinery and intellectual property. The decline, the first after five consecutive years of increases, was mostly due to a 12.7 per cent drop in business investment in non-residential structures. Statistics Canada also found the country's terms of trade shrunk by 6.9 per cent last year, which followed a 1.3 per cent decrease in 2014. Economists, however, found enough positives in the late-2015 data to suggest the new year is off to a better start than expected. In December, real GDP grew at a month-to-month rate of 0.2 per cent, which was slightly better than most economist forecasts. That number followed monthly increases of 0.3 per cent in November and 0.1 per cent in October. The more-encouraging finish to 2015 led BMO to hike its real GDP projection for all of 2016 to 1.2 per cent, up from one per cent. "Upside surprises for Canada have been few and far between over the past year, so this modest beat is certainly welcome,'' BMO chief economist Doug Porter wrote in a research note to clients.